Prosecutors routinely leave out whether a defendant charged with illegally entering the country has asked for asylum – a fact that could fundamentally impact a case. The government claims it leaves asylum requests out of documents for privacy reasons, but one attorney challenging the omissions says the real goal is criminalizing asylum under cover of darkness. Defense attorneys have started noticing that something is missing from the arrest reports and complaints involving some of their clients charged with illegally entering the country. Nowhere in those documents does it note when defendants have asked for asylum. Information about whether someone is seeking asylum in the United States could have a fundamental impact on the hundreds of cases in which people are being prosecuted for entering the country illegally under Attorney Jeff Sessions’ zero tolerance policy. And it’s unclear whether it’s even legal for the government to prosecute asylum-seekers. The government argues that including whether a defendant has asked for asylum would violate his or her privacy rights, among other concerns. But one attorney challenging the government’s policy of omitting the information argues that the real goal is criminalizing asylum requests without anyone noticing. Abdul Hamid is a Bangladesh native being charged with a misdemeanor for illegally re-entering the country. He had an expedited hearing earlier this month as part of Operation Streamline, a program new to San Diego’s federal courts meant to fast-track misdemeanor prosecutions of those caught crossing the border illegally. Hamid is also an asylum-seeker. Hamid was apprehended along with another individual from Pakistan approximately 500 yards north of the U.S.-Mexico border and two miles east of the Otay Mesa Port of Entry, according to the complaint against him. Probable cause statements are key to arrests – they are essentially law enforcement’s reasoning as to why they apprehended someone. Judges use them to determine whether the arrest was merited and how the case should proceed. Crawford agreed that the omission of the information about defendants being asylum-seekers was concerning. There has long been a question of whether the government actually should be prosecuting asylum-seekers for crimes related to illegally entering the country, based on language laid out in the 1951 Refugee Convention, to which the United States is a signatory and which provides a legal basis for much of U.S. asylum law. Additionally, if the government insists on prosecuting asylum-seekers, some attorneys argue their criminal proceedings should merit the same level of protections as their immigration proceedings, meaning their hearings and many related documents shouldn’t be public because of the sensitive nature of asylum claims. The special assistant U.S. attorney from Customs and Border Protection, Amy Dell, who was handling the streamlined illegal entry misdemeanor prosecutions that week, told the judge the government believes it would be illegal to include information about whether a defendant was seeking asylum, citing the Privacy Act and another regulation, which she did not specifically name. The brief was filed last week under seal, meaning the public won’t know why the government is keeping the fact that some of the people they are prosecuting are seeking asylum from even judges. Voice of San Diego submitted a letter to the court Monday requesting that the brief be made public given the potential impact on hundreds of cases being prosecuted in the Southern District of California. As Wheat argues in his response to the government’s sealed brief, if privacy was the concern, the government could file the complaints under seal or only identify a defendant by initials, as it does with juveniles. The fact that prosecutors are wholly omitting asylum claims, he said, demonstrates that they are trying to withhold pertinent information from the court. Wheat requested that the government disclose every instance in which it did not include asylum requests in the probable cause statements in the Southern District of California and all other districts. Hamid’s case is not the only instance where government prosecutors have tried to keep information about defendants’ asylum claims from entering their criminal proceedings. Last Monday, two mothers who had been separated from their children and who were members of the migrant caravan that arrived in Tijuana in April were both found guilty of illegally entering the country. They had been arrested in a group of 18, including children, and the Department of Justice had touted their arrests and criminal prosecutions against the 11 adults in a press release. Magistrate Judge Ruben Brooks, who was overseeing the trial, overruled those objections. An organizer from Pueblos Sin Fronteras, the group that accompanied the caravan, testified that a month prior to arriving at the border, the women had expressed they wanted to apply for asylum in written documents collected by caravan organizers. 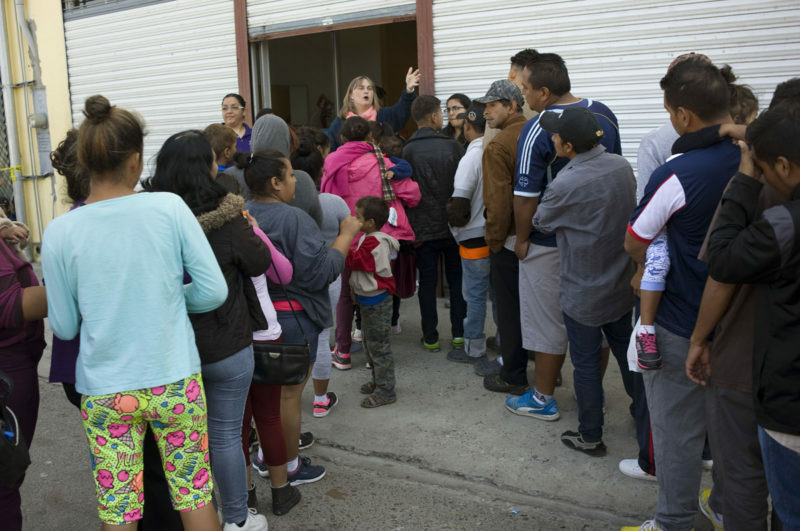 The organizer also testified that the women knew asylum-seekers were being turned away at ports of entry – a matter in a current lawsuit against U.S. Customs and Border Protection. The women were found guilty, but how and when they asked for asylum played a role in the decision. Brooks noted that a Border Patrol agent testified that the women did not request asylum while with him. Brooks also said that although the women had “contemplated seeking asylum in March,” when they had filled out the documents for the caravan organizers, they did not necessarily show that same intent in April, when they chose to enter the country in a place other than a port of entry. It’s not clear whether Brooks’ verdict would be altered if there had been evidence that the women had requested asylum as soon as they were apprehended, but his desire to hear about their asylum claims despite prosecutors’ objections and his inclusion of the details about their intent to seek asylum in his verdict demonstrated that he considered their asylum request while weighing the case. The question of whether prosecuting asylum-seekers for illegally entering the country is proper has come up repeatedly in federal courts along the border. The United States is a signatory to the 1951 United Nations Convention on the Status of Refugees and the 1967 Protocol, which govern much of international asylum law. Some countries who also signed on to the protocol, like the United Kingdom, have codified their intent not penalize asylum-seekers in their own immigration laws. The United States has not. The report also noted that Border Patrol sectors were handling asylum-seekers inconsistently – some were referring them for prosecution and some weren’t because officials said they weren’t sure if it was allowed. According to the report, CBP had said it would come up with guidelines across sectors later that year. The agency has not responded to a request about the guidelines. New guidance given earlier this month to officers who interview asylum-seekers at the border – the first step in determining whether their asylum claim will come before an immigration judge – seeks to make it much harder for those who entered the United States between ports of entry and who are convicted of illegal entry to seek asylum. The guidance says officers “may find an applicant’s illegal entry, including any intentional evasion of US authorities, and including any conviction for illegal entry where the alien does not demonstrate good cause for the illegal entry, to weigh against a favorable exercise of discretion” for asylum, according to CNN. If the government omits defendants’ asylum requests from court documents when it prosecutes them, it may be able to more easily secure a conviction against them, and then use that conviction to deny asylum. There are federal regulations guarding asylum-seekers’ privacy. Many are fleeing for their lives because of persecution for their political views, religion, gender or sexual orientation. Their claims could endanger family members still present in the country from which they are fleeing, or result in retaliation against them if they are sent back. That means the government can’t disclose to third parties the fact that someone requested asylum or other details about their claim. Immigration hearings can also be closed to the public at an asylum seeker’s request. The regulations also state, however, that such information can be given to government officials and U.S. federal or state courts on a “need to know basis related to certain administrative, law enforcement, and civil actions,” according to a 2012 U.S. Citizen and Immigration Services fact sheet on asylum confidentiality regulations. That means that in the case of criminal charges under zero tolerance, as Hamid’s attorney argued, the government could include information about asylum claims under seal or using other measures to protect a person’s privacy, rather than keeping it off the record entirely. One defense attorney, Andrew Nietor, who handles both criminal and immigration cases, is asking the court to close the hearings for one of his clients, a Honduran asylum-seeker who is being charged with illegal entry. Nietor also noted in the motion that the government should dismiss his client’s case because asylees should be exempt from criminal prosecution. The government hadn’t included his client’s status as an asylee, who had expressed fear of persecution and torture, in the complaint or probable cause statement either. “That information would have arguably precluded this Court from signing the Complaint since it would have been in contravention of the Refugee Convention and the 1967 Protocol,” Nietor wrote. Nietor said in an interview that while privacy and protections for asylees is important, it should be the defendant invoking those rights – not the government prosecuting them. Nietor noted that the merging of immigration and criminal proceedings under zero tolerance will cause other issues for asylum-seekers and force defense attorneys to become familiar with a whole different area of law. In an immigration context, Nietor said, asylum-seekers are supposed to talk to government officials upon their apprehension about why they fled their country. But as criminal defendants, they’re being told they have the right to remain silent and that they should be talking to their attorneys first. “That invocation of their rights is being used against them,” he said.